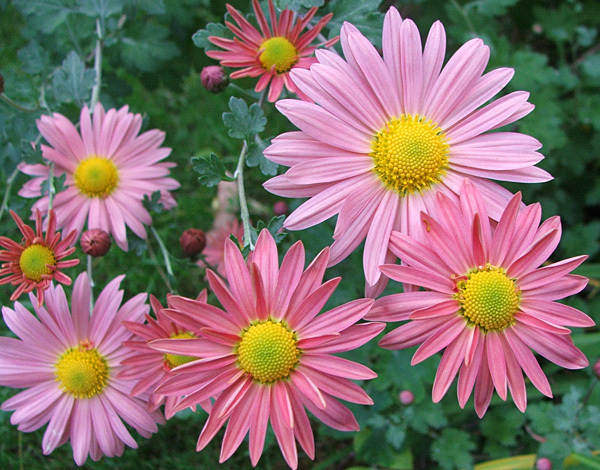 In the real garden I grow only two Chrysanthemum varieties, plain and common, both straggly no-nonsense plants with long stems. One provides a flash of bright yellow underneath the house lawn's gum tree. These were originally growing by the glass-house door. The first Autumn that they bloomed they stole my heart. 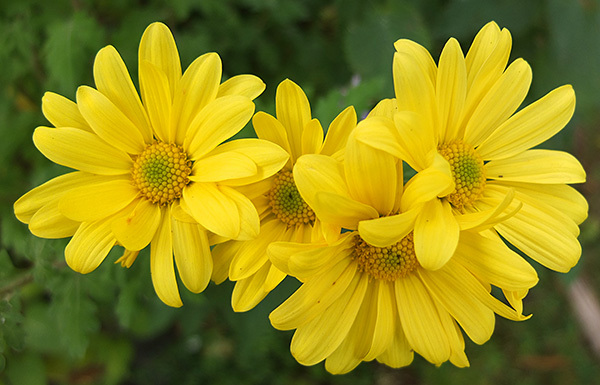 Their yellow flowers are the brightest in the garden, a cheerful and optimistic colour. They remind me of the changing seasons, making me look ahead to spring bulbs and summer sunshine. The other, a subtle warm pink, spreads and flops itself in the Stables Garden near the grass path. No excuse to miss this, and it's guaranteed to be gratefully photographed each autumn. My temperate winters allow these plants to stay outside all year in the ground. I choose not to have pots of Chrysanthemums in the house. Or, to be strictly accurate, I choose not to spend money on them. Hint, family, hint!